At The Sanctuary Spa we offer an environment free of artificial nails and toxic smells! Our clients come to us because we offer a safe solution to their nail problems in a clean, relaxed environment. Our clients return time after time because of the results they see! Sanitation is our utmost priority! Our pedicure chairs are pipeless units, meaning there are no hidden places for bacteria to hide! Most pedicure systems are not pipeless causing cross contamination, which means infectious bacteria can spread from client to client. There is no chance of that here! We also use new, disposable nail kits with every service. Our clients’ safety and well-being are our number one priorities, so we have created protocols and use products that are the safest and of the highest quality available. To maintain this, we make a lot of our scrubs and signature products in house! Our clients include athletes, whose feet take abuse, individuals with diabetes and other health challenges requiring extra care. Treat yourself today! Let us help you improve the health of your hands and feet! We also specialize in custom nail art.. Check out our Facebook page for pictures! A unique hybrid polish “dip” manicure designed to last 2-3 weeks. While relaxing in a massage chair your feet are bathed in a whirlpool of your choice of our current scent selections. 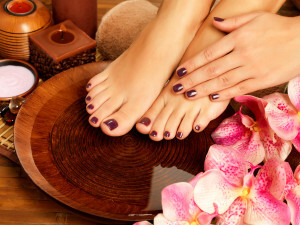 This perfect pedicure includes nail shaping, exfoliation, foot and leg massage, warm towels and polishing. During this divine pedicure experience you will drift away while you soak up this refreshing, relaxing, scent-sational treat for your feet! This oxygen infused pedicure will sooth, invigorate, hydrate and soften your feet. This unique pedicure includes a bubbly oxygenating soak, a sugar scrub, an oxygenating mask and a relaxing massage. While relaxing in a massage chair your feet are bathed in a whirlpool of our Mint Mimosa Oxygen Soak. This luxurious pedicure includes everything in the O2 Oxygenation Spa pedicure PLUS a hot stone massage and collagen foot treatment. Simply fabulous! An intense hydrating and anti-aging treatment for your feet! This amazing treatment will leave your skin feel smooth and supple!